Urban Algae Folly, designed by ecoLogicStudio, the practice of Bartlett Lecturer Claudia Pasquero, is to be unveiled as part of the Future Food District project curated by Carlo Ratti Associati at the Milan Expo 2015 on 1 May. 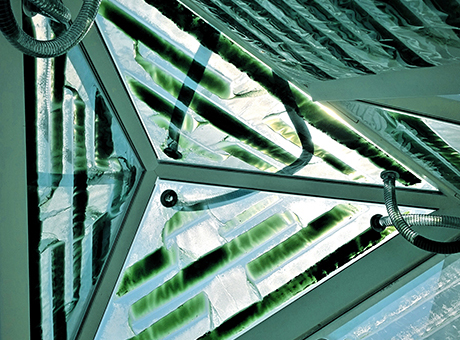 A combination of micro-algal cultures and real-time digital cultivation protocols, the interactive pavilion has evolved from ecoLogicStudio’s six years long research on building integrated bio-digital systems. The structure is designed to control the flow of energy, water and carbon dioxide based on weather patterns, visitor's movements, and other environmental variables. Once fully completed, the canopy will be able to produce the oxygen equivalent of four hectares of woodland, along with nearly 330 pounds of biomass per day. Visitors to Milan Expo's Future Food District are invited to interact with Urban Algae Folly via a series of harvest events or via their smart phones. Claudia Pasquero is Director of the Urban Morphogensis Lab, part of the B:Pro MArch Urban Design programme at The Bartlett School of Architecture.